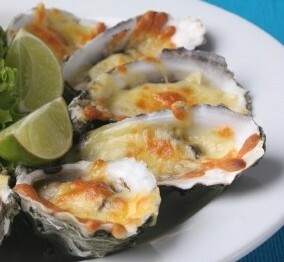 Oysters Rockefeller is the perfect way to serve oysters, especially if you are not fond of raw oysters. These are cooked and delicious. Very simple to make, this oyster recipe does not have specific quantities. See notes below in the “Did You Know?” section. Cream the butter with the onion juice, parsley, salt, cayenne, bacon, spinach and bread crumbs. Season the oysters with salt and pepper, then cover them with the butter mixture. Place the shells on baking sheets covered with a layer of rock salt. Bake for 10 minutes or until plump. Turn the oven to broil. Place the oysters under the broiler to brown and serve at once. I find, for this recipe, that frozen spinach works as well as fresh. Just wring it quite dry when thawed and chop finely. You can also chop it in the food processor. 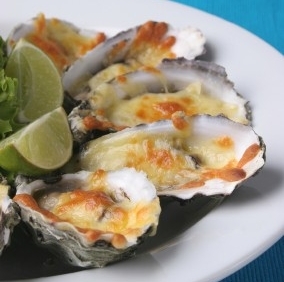 Some people top oysters Rockefeller with a bit of cheese and melt it under the broiler. 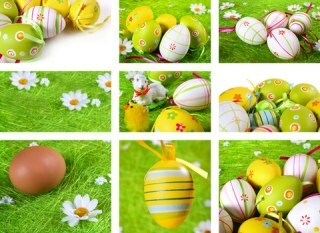 It is not part of the original recipe, but quite delicious. Here is a tasty variation of the traditional oyster recipe: With the oyster removed, half fill the shell with creamed spinach. Place the oyster on the spinach. Cover it with a teaspoon of chopped parsley, a few drops of lemon juice and Worcestershire sauce and a small piece of bacon. Cook as in the directions above. The onion juice, salt and cayenne are used in small quantities to suit your taste. The minced bacon, puréed spinach and chopped parsley in this recipe are added in fairly equal amounts. Add enough butter to cream them all together well. Then add enough bread crumbs to hold it all together but still keep the mixture moist. You can easily adjust the recipe to fill however many oysters you are making. If you like this recipe, I’d love you to Pin it to Pinterest, Tweet about it, Like it on Facebook and leave a comment and a recipe below. This recipe for oysters Rockefeller is just one of our delicious fish and seafood recipes perfect for entertaining.